For most businesses, customer retention is a number one priority. Although you may offer the best prices and customer service support, how do you show your customers that you appreciate their business? While it sounds obvious, how often do you hear a cashier say “Thank you, we appreciate your business?” Not as often as we’d like. In fact, it is sometimes a stretch to even get a greeting, let alone a thank you. A loyal shopper of Christmas Tree Hill, I frequent their store at least every other week. Each time, the cashiers are friendly, and I am always amazed as they verbally express their appreciation for my business. Simply put, it is nice to hear words of appreciation. Encourage each of your customer service representatives and cashiers to sincerely offer words of appreciation to every customer, regardless of the amount of their purchase. Occasionally send out a postcard with new products or services, as well as an exclusive coupon. If you have an e-mail list, this is often a cheap and effective way to keep your customers active and up to date on your store. 3) Keep your records updated. If you notice that a customer hasn’t returned in a while, send them an e-mail or postcard invitation to stop back in. They will appreciate that you have noticed their absence and will most likely take you up on the offer. Implementing these steps is not enough. Be sure that each “thank you” is genuine. If your employees are simply saying it out of obligation, the customer will notice. Instead, remind your employees that the customer directly affects their job. Without customers, there are no jobs. They may see the customer in a new, more appreciative light. Selling the product isn’t enough. Do a follow up call to ensure that the product has arrived on time and is correct. If you notice a return, do a follow up to ensure the customer is satisfied with their replacement. It will only take a few minutes and will prove that each order is important to your store. Every customer wants to feel appreciated. 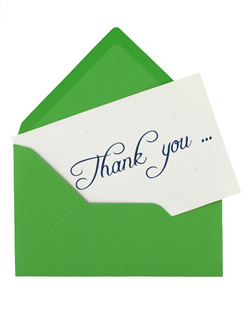 It is not expensive or time consuming to offer simple words of appreciation or to send a postcard. Show your customers that they are more than just a form of payment. Show them that you appreciate their business with these simple, yet effective steps.